RPI-HIFI-AMP amplifier module is a high-quality, highly efficient 25W Class-D power amplifier for your Raspberry Pi audio project. You can get a stereo audio system by mount it onto your Raspberry Pi. Only thing you have to do is connect your loudspeakers to our module. It’s the ideal choice for small room audio system. Up to 25W output power. Capable of driving 4 Ohm speakers or higher. Fully controllable from the Raspberry Pi. Support 44.1kHz and 48kHz sample rates. Digital-analog conversion included—no need for external DACs or sound cards. Fully digital sound path for optimal audio performance. Connects directly to the Raspberry Pi no additional cables needed. Wide Power input :12-20v external power input for both RPI and module. Integrated EEPROM for automatic configuration (Option). Remark：Right+,Ring- are a set of signal，Left+,Left- are another set of signal. 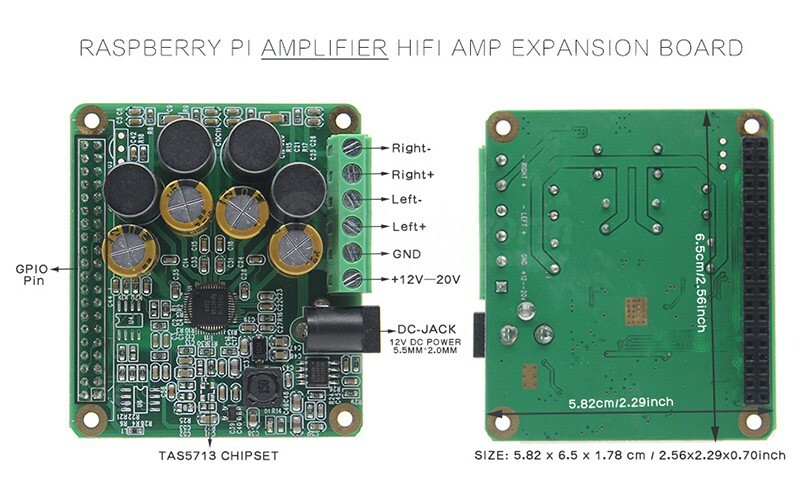 Attention：When Using RPI-HIFI-AMP Amplifier HIFI AMP Module，no need to power the raspberry pi. Any questions when you connect the cable, please contact us. ​Note: the raspberry pi 3 board is not included. attention to align the first leg of the raspberry pi and RPI-HIFI-AMP module. OSMC / Max2Play / RuneAudio / Volumio / Moode / PiCorePlayer / PiMusicBox / OpenELEC etc. You can choose a suitable for your own use .